A sweet and not so scary treat to celebrate Halloween! Fun and festive Skull, Witch, Frankie, and Pumpkin Chocolate Lollipops. 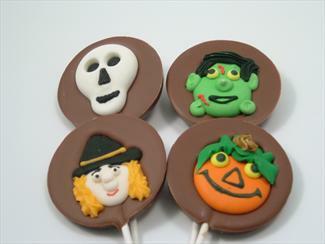 Our chocolate lollipops are a scrumptious way to celebrate Haloween! Adorned with edible icing, our Halloween Pops are sure to be a scream!